These days it seems like every winery has their own special blended red wine. If it's from California, it probably has some Zinfandel and Merlot and a couple of others to make it seem like they spent countless hours inventing a one-of-a-kind vino to make the world beat a path to their doors. My thought is some of those wineries are just trying to take up more shelf space at the wine stores. Most of the time they are pretty good table wines. They don't have much character but they taste good and pair well with spaghetti. When I heard that the Rutherford Wine Company was working on a new blend, my first reaction was there is going to merely be one more red wine I have to try fitting into the racks at the wine shop. I didn't know the name, hadn't seen the label, and didn't know what the blend was going to include. Their flagship brand Rutherford Ranch has been very good at making outstanding single varietals like their Cabernet, Zinfandel, and Sauvignon Blanc. So, as I thought more about it, I was cautiously optimistic about a blend from them. What emerged from their tasting room was what I was fortunate enough to try last night, Rhiannon. Rhiannon is the Welsh goddess of magical birds, horses, Earth and fertility. It is believed that she represents the bridge between steadfastness and change. Translating that into wine speak, it means that every year's grape harvest is completely different than the last. Even though the blend of the wine is the same from year to year, the taste fluctuates with what the earth and climate do to the vines. It's the same in some respects, but different in others. What it means for the wine drinker is you get a different wine with each vintage, but it will always be good. Change with steadfastness. This wine has a great label and the wine itself has won a lot of gold and platinum medals in wine competitions. Personally, that doesn't mean much to me. It could win a thousand awards but if I don't like it, then those mean nothing. Thankfully with this wine, the awards are accurately given. The wine is about a medium on the tannin scale which gives it a soft, even fruitiness that makes it easily drinkable. The main characteristics that I tasted were something like a bright red cherry and a touch of vanilla from what I'm assuming is oak influence. The aroma and aftertaste were the same for me with a kind of dark fruit salad explosion. It sounds messy, but it was rich and wonderful. This wine would pair nicely with baked ziti, pork chops, or, dare I say, a big juicy grilled hamburger. 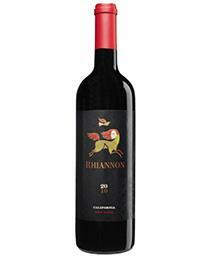 In a world full of red wine blends that fall short of interesting, Rhiannon is at the opposite end of the spectrum. Retailing for between $12 and $15, this could easily be my everyday red. Cheers.